In case you missed the milk-and-toilet-paper rush at the grocery store, there's a snowstorm predicted for this weekend. 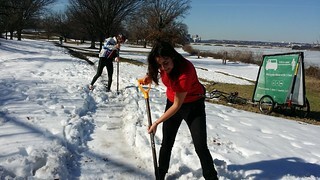 You too can be like the cool and helpful people in the first photo below, and help clear snow off the Mount Vernon Trail. 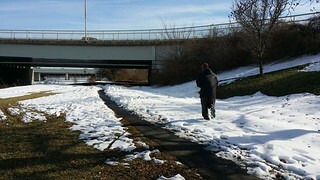 The details: the Friends of the Mount Vernon Trail are planning to shovel snow off the trail on Monday afternoon, January 14. We'll start at the LBJ Grove and (time permitting) work southward to hit the usual trouble spots -- the Humpback Bridge, the area by the ramp up to the 14th Street Bridge, and the underpasses south of the 14th Street Bridge. Please show up any time during between 2:00 and 6:00 p.m. and stay for however long you can. We'll provide snow shovels, although feel free to bring your own tools. Also, we're keeping an eye on the forecast and will post an update no later than 5:00 p.m. on Saturday if plans change. Quick update: I still plan to shovel on Monday afternoon -- and if this forecast holds, I'm going to need all the help I can get. The only change is that I'm now planning to be there starting at 1:00 p.m. Please feel free to stop by any time between then and 6:00 p.m., even if it's just for a few minutes. Thanks, and hope to see you there. Everybody should up for this at least to say hello. Play your cards ride and Komorebi might let you use the Friends of Mount Vernon Trail's brand new 36" Snow Plow: The Snow Pusher, a tool which will OBLITERATE SNOW. Don't forget. This is a double point event for the Queen of the Trail and King of the Trail prize. Please, please, please let the snow for Sunday (ideally, in the further surrounding areas of DC) be significant enough to trigger a Federal snow closure Monday morning (if that is that even possible during a partial shutdown?? -- a Federal snow closure Monday is the only way I'll have the day off, to come help out any time during the hours you listed! Snow day wishes granted! I will endeavor to be at LBJ at 1pm... will you be starting out in the marina parking lot, or some central departure point, or should I just walk under the parkway bridge and look for shovellers? It looks like I’ll probably be able to get there around 1. Due to a not great software deployment I have tomorrow off in exchange for staying up until 4 a.m. Awesome, thanks! 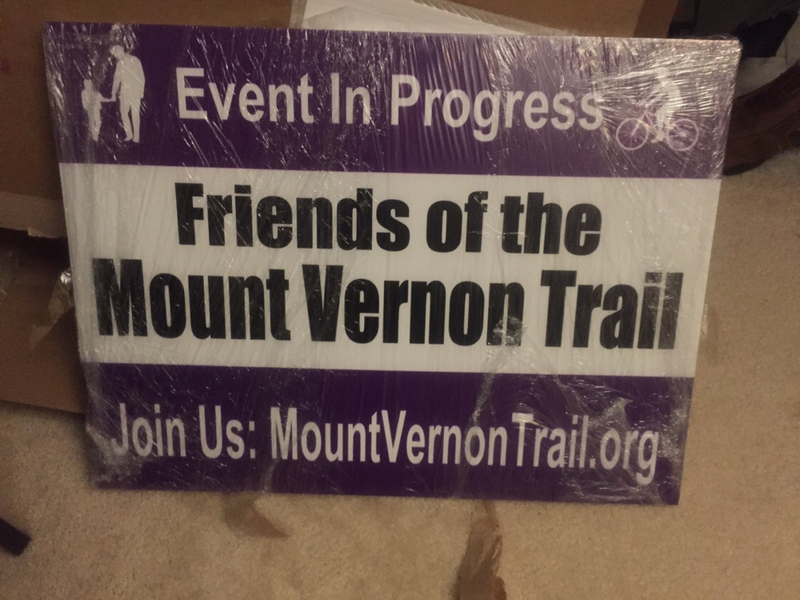 Look for yellow shovels and bright purple signs saying Friends of the Mount Vernon Trail. My plan is to start at the wooden bridge connecting the Pentagon and the LBJ Grove, then move east and south toward the MVT. Our exact location will depend on what (if anything) NPS is able to clear before 1:00 p.m. NPS announced last week that they'd be clearing sidewalks in the D.C. area despite the government shutdown, but I don't know whether that includes the trails on the LBJ Grove --> Navy-Merchant Marine Memorial --> Humpback Bridge route. If it doesn't, then we'll try to clear that section first. If it does, then we'll move south and tackle the area near and under the 14th Street Bridge. I’m looking forward to seeing folks out there. Don’t forget that if you’re competing for King or Queen of the Trail points today’s snow removal is worth double points. I read your text too fast and was sad when I didn't see this.